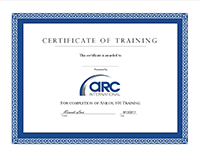 ARC International offers training our both of our facilities and In-house at your facility. To get maximum results from your equipment and an acceptable return on your investment, your team must be continually kept up to date on the care, handling and use of all equipment and ancillary components. ARC International is proud to offer tailored training packages for all personnel levels. Our exceptional training ensures that your team members fully understand how to take care of, maintain and handle each of the key components that impact the performance of your presses or converting equipment. Training is offered both onsite and offsite at times and places to suit your team. Everyone who attends our press optimization training program receives an individual training certificate.